I read this book some time ago, and I quite enjoyed it. It was refreshing. "Talk about unlucky sevens. An hour ago, seventeen-year-old, seven months pregnant Novalee Nation was heading for California with her boyfriend. Now she finds herself stranded at a Wal-Mart in Sequoyah, Oklahoma, with just $7.77 in change. But Novalee is about to discover hidden treasures in this small Southwest town--a group of down-to-earth, deeply caring people willing to help a homeless, jobless girl living secretly in a Wal-Mart. From Bible-thumping blue-haired Sister Thelma Husband to eccentric librarian Forney Hull who loves Novalee more than she loves herself, they are about to take her--and you, too--on a moving, funny, and unforgettable journey to . . . Where the Heart Is." 06/01/04: I enjoyed this book a couple years ago. I'd like to start a bookray with this. Released on Wednesday, June 09, 2004 at Bookring in Bookring, A Bookring Controlled Releases. Book arrived safe and well this morning. Thanks very much. This book is a definite grower. For the first few chapters, I wasn't even sure I was going to finish it, as I felt Novalee was a silly, annoying girl and I wanted to slap her on numerous occasions. But by the end of the book, she had grown and developed into a heroine I was rooting for every step of the way. There's a short interview with the author at the back of the book where she says all the characters in the book are based on people she knows. This certainly shows - the characterisation is the best part of the book. Nobody is a stereotype, and there is a huge amount of affection there for people whom the rest of the world would dismiss as 'trailer trash'. There were only a couple of jarring moments, such as the first meeting between Novalee and Forney in the library. This is one of the relationships which drives the book, yet we jump from their first meeting in the library, where Novalee is nervous and Forney is just odd, to her arriving at his place for a birthday dinner. I feel were were cheated out of a 'getting to know you' section which would have been mighty interesting. The part where the mother turned up at the hospital - the mother who had abandoned Novalee ten years previously - also seemed to strike a false note. Novalee just seemed to accept her and didn't once question why she had walked out all those years back. But these are minor gripes - it is a moving story well told. Now on its way to Stellarv in Brazil. Got the book two days ago. I still have some reading to do, but I'll try not to take so long. It's a really dense reading. Lots of action all the time, new people, new facts and lots of beautiful and deep relationships along the book. Something to be read and never forgotten. I already got airyaa's address, and will be mailing the book next Thursday, September 30th. Sent today to airyaa. Have a good reading! But the book... liked it. I don't know why but the feeling I had when I read it was: "how people can be so lonely and at the same time, not lonely !" and also "What ever you do, you'll be rewarded or punished in this world... no matter if there's any heaven or hell... you'll be judged in this world too." I'm waiting for answer from Davitraka now. Released on Tuesday, December 07, 2004 at about 1:30:00 AM BX time (GMT-06:00) Central Time (US & Canada) at Sent to another BCer in London, England United Kingdom. Received this today - how exciting to have a parcel from Iran! I will read this as soon as I can - will start it within the next couple of days. I see I'm to pass this on to dodau so will PM for the address. Released on Saturday, December 18, 2004 at about 6:00:00 AM BX time (GMT-06:00) Central Time (US & Canada) at Sent to a fellow BookCrosser in Controlled release, England United Kingdom. I have dodau's address and am sending it 1st class today. It *might* get there in time for Christmas! I hope this works - I have had to go into the book on JeepACV's bookshelf as mine is not showing my books at the moment! Anyway - I have read this book and loved it! Novalee is an excellent, complex central character. But the other characters were equally well-drawn, rounded and believable. It reminded me both of Anne Tyler and of my other favourite writers like Jill McCorkle. I'm a sucker for American small town community novels and certainly found a good one here. In fact I'm going to see if I can buy a copy! I have actually read Letts' other novel (name escapes me) which was just as good. If I have it, I will offer it on a ring. Thanks for including me on this Ray, JeepACV - I'm glad I signed up! It did get here in time for Christmas. What a surprise for the Royal Mail. I have a couple of rings in front of this one but started the first last night so I should be able to get through them all by the New Year. I'm not sending anymore post until then anyway. This looks really good and the reviews are good so I'm looking forward to it. I really enjoyed this and read it pratically in one sitting. I found the heroine very naive at first, was I that stupid at 17, probally. But by the end she had really grown. I found the ending a little predictable though. And what a silly name for a baby. Will pm BrooklinBrat for her addy and get it out to her next week when the PO's open again. Released on Tuesday, January 04, 2005 at about 5:00:00 AM BX time (GMT-06:00) Central Time (US & Canada) at Surface Mail in Fellow Bookcrosser, A Bookray Controlled Releases. Woohoo! Forgot I was even signed up for this bookray, so this is a nice surprise! A nice, "feel good" book. 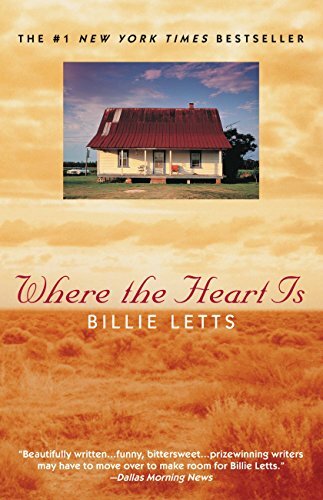 I enjoyed Billie Letts's writing and all of her characters, even if a lot were too good to be true. A quick, easy read - I finished it in a day. The spine is cracked, so I don't want to wild release it in case the pages start falling out. I think I'll start a ray to continue it on its journey. Sent to brookeh 8/26/05. Enjoy! I'm so excited to get this book today! I just finished a read last night & had yet to start on the next one. Looks like this one will be butting in! just received this book in the post today, along with a sweet card from sdkelley. Thanks! This just arrived today. Thanks for sending it, nice-cup-of-tea! Will read it ASAP. I loved this book!! I liked all the quirky characters and the way the story was told. A really nice read! I'll PM the next person on the list for their address and send the book on asap. This was such an enjoyable read, really loved it! I'm sorry it has taken me so long to journal this, but it has been sent on to another bookcrosser in Queensland to read to keep the ray moving..... Thank you so much for sharing this book, it was terrific. I caught this book being offered for giveaway on a local website and grabbed it when I recognised it as being one I always wanted to read. I have thoroughly enjoyed it and read it in a flash. I know quite a few people who will love to read it also so will share with family and friends. I promised the lady I got it from that I will post it back on to the site after I have finished with it so hopefully it will go to another good home to be shared with many others.